Today, I’m delighted to welcome Cass Morris! 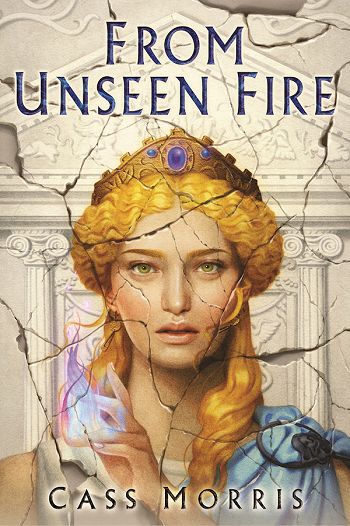 From Unseen Fire, her debut novel and the beginning of a new epic fantasy series based on Roman history, will be released on April 17—exactly one week from today. While waiting for its approaching publication date, you can read an excerpt from the opening of From Unseen Fire on the Penguin Random House website (as well as her essay below, of course!). Politics deeply divided between two parties. Rampantly rising inflation, and wages failing to keep pace. Armies hopelessly entrenched in foreign wars. Concern over the ability of the state to provide food and healthcare for the poor. Complaints from venerable elders about a degenerate and hedonistic younger generation. An influx of immigrants fueling the economy and unsettling the protectionists. America in the 21st century? No, I’m talking about Rome in the waning decades of the Republic. When I began writing From Unseen Fire in 2011, I had little notion how resonant some of its themes would feel a few years later. The book takes place in what would be, for us, the 60s BCE, the final decades before the collapse of the Roman Republic into the Roman Empire. The politics focus on economic insecurities, on a diversifying population, on the impact of colonization, and on women finding ways to make their voices heard in the public sphere. Those issues are perennial, of course, but they’ve all been magnified in the past couple of years, to the point where my editor and copy editor both commented on parallels they saw to figures from the 2016 election cycle. I didn’t intend that—no character in From Unseen Fire is meant to be an analog of anyone in the present—but I’m not sorry for it, if readers nonetheless see in them a reflection of our modern world. On the flip side, while nothing in From Unseen Fire is taken directly from history, it does all have historical precedent of some kind, none of it anachronistic by more than a couple of decades. The arguments in Aven’s Forum draw from those made in Rome’s by Cicero, Cato, the Gracchi brothers, and, yes, Julius Caesar himself. It’s the job of sci-fi and fantasy to hold a slightly warped mirror up to reality, to show us ourselves through a tarted-up lens. It’s easier, sometimes, to swallow a political message when it’s wrapped in wizard’s robes or loaded into the cargo bay of a spaceship. It’s how Tolkien could get us to contemplate the purpose and nature of warfare, how N. K. Jemisin asks us to examine prejudice and power structures, how Terry Pratchett poked at nearly every aspect and assumption of society. Any number of articles have been written on the effect of the “Harry Potter generation”, positing that kids who read fantasy fiction grew into adults with a keener sense of social and political awareness. Think about the signs at any large protest from the past few years: chances are good you’ll see references to everything from The Handmaid’s Tale to The Hunger Games. At the same time, though, that fictional distance can also let people willfully ignore the message while taking on the aesthetic: witness the occasional attempts to co-opt the Rebel Alliance or Resistance out of Star Wars by people whose platforms are those of the Empire or the First Order (or worse, the subset claiming that the Imperials are the good guys and blowing up a planet was a totally justifiable response to a perceived threat). The grounding that history can add to the SFF mix, I think, is a sense of just how often we as humans grapple with the same problems. I’m something of a magpie historian, interested in many different eras and places, and I’ve noticed that again and again, the whole world over, the same questions crop up. Do we roll with cultural shifts, or resist them? What traditions are worth preserving, and which are inhibiting growth? How do we weather economic tides, both in our private lives and in the public state? Who gets to control our government: the wise, or the mighty, or the wealthy? How far can a political pedigree get you—and how far should it be allowed to? Democracy is great in theory, but what do you do when the people make choices that are less than stellar? Is some divine force guiding our nation and its destiny, or are we on our own? There’s a trap here, too, though. History is largely written by the victors, and that’s not just about the victors in war: it’s also about socioeconomic victors. We know the most about the folk on the top rungs of the ladder. There are prominent women in Roman history, of course, but because the histories were all written by men, it’s hard to sort out truth from propaganda. Women in the Roman historical record, whether Roman themselves or foreign, tend to fall into one of two categories: untouchably virtuous matron (Cornelia Scipionis, Octavia, Julia Domna) or power-hungry deviants (Livia, Agrippina Major, Plotina, Sabina, Boudicca), the latter often with a side of sexual intemperance (Messalina, Agrippina Minor, and of course Cleopatra). Creating fictional characters from a historical base often means stripping back layers of embellishment, then piecing together what’s left and patching the holes with guesswork, supposition, and invention. Stacy Schiff’s Cleopatra: A Life does a wonderful job picking this apart from a historian’s viewpoint; the fiction author then has to apply that kind of work inside a narrative context. The same problem crops up with other groups of people, too. Much of what we know about the Celts, for example, comes from what the Romans—their enemies—wrote about them. Caesar found the Gauls barbaric but thought they had the potential to be civilized (by, of course, Roman standards), but decided the Germans were beyond redemption. Diodorus Scaurus wrote that the Irish Celts ate their fathers, slept with their mothers and sisters, and generally believed them “complete savages [who] lead a miserable existence because of the cold”. Even the name we know them by was likely bestowed upon them by the Greeks, who called them the Keltoi, rather than being anything they called themselves. Not exactly what we would call unbiased source material. And then there are the people no one bothered to write about at all. Rome’s poor and slaves were by far the largest classes of its inhabitants, but they leave the least behind in the historical record. To find out what their lives were like, you have to go past written sources and into the real guts of archaeology—making inferences from the stories left on tombstones, from graffiti unearthed in long-buried walls, from the detritus of everyday life ground into the earth and forgotten for centuries. Mary Beard’s documentary series “Meet the Romans” is a wonderful example of a historian determined to bring social history to life rather than relying upon the broad, blinding strokes of the “great men” model of viewing the world, as is Alberto Angela’s book A Day in the Life of Ancient Rome. I’m using Roman history for my examples here, because that’s where my mind has been living for several years, but the same holds true no matter what the place and era we’re talking about. In the author’s notes for The Girl in the Tower, Katherine Arden talked about facing similar challenges and excitement when re-creating the world of medieval Russia. Rowenna Miller’s recently-released Torn, though it takes place in an invented world, is clearly based upon meticulous research into the lives of average citizens in 1780s/90s France and England, just as Lara Elena Donnelly’s Amberlough invokes the atmosphere of 1930s Berlin. Any author dealing with historical inspiration, even at a tangent, has some wrangling to do. SFF and history are often seen as separate genres, separate fields, fact versus fiction and never the twain shall meet. I’m not sure that’s ever really been true. Mary Shelley’s Frankenstein was a social commentary as much as the progenitor of science fiction, and Tolkien based the cultures of Middle Earth on those of Europe throughout the centuries. But I have a sense that the intersection of the fantastical and the historical is becoming even more potent here in the dawning decades of the new millennium. Maybe it’s because the world we’re living in is one that puts the art of storytelling into a particular kind of crucible, where readers and writers alike are reaching for truth in a narrative that is part-cautionary tale, part-reflection, part-aspiration—and, perhaps, where we might be able to find the key to keeping our own republics from collapse. Cass Morris currently lives and works in central Virginia and on the Outer Banks of North Carolina. 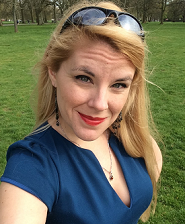 She completed her Master of Letters at Mary Baldwin University in 2010, and she earned her undergraduate degree, a BA in English with a minor in history, from the College of William and Mary in 2007. She reads voraciously, wears corsets voluntarily, and will beat you at MarioKart. From Unseen Fire is her debut novel. Find her on Twitter: @CassRMorris.